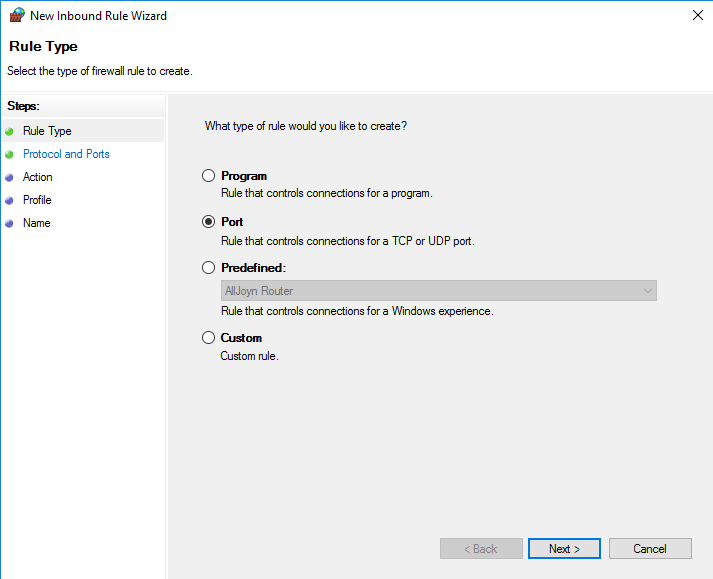 Wizard setup of CA 11.0.6 for SSO on Windows 2012 R2 server. How setup IIS for SSO with CA 11.0.6? This solution is using the tool provided by IBM for configuration of the IIS. – Internet Options, under Security – Local Intranet – sites, Advanced, add the CA 11 servers to the zone. Create a empty database named “contentstore” on the Microsoft SQL server. 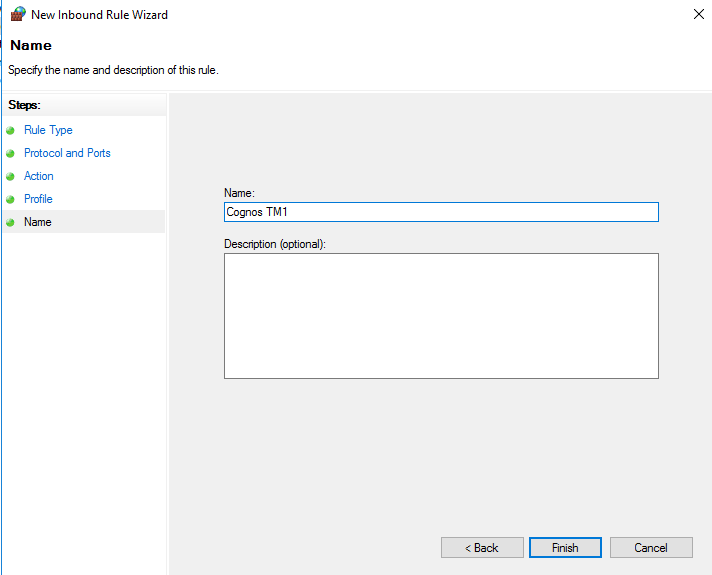 Create a SQL login name cognos with password cognos204. 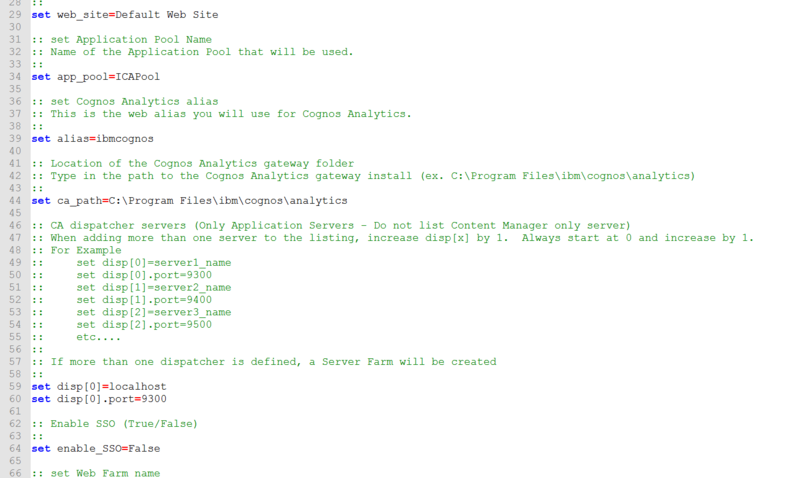 Set the SQL user cognos to be DBOWNER of the database “contentstore”. 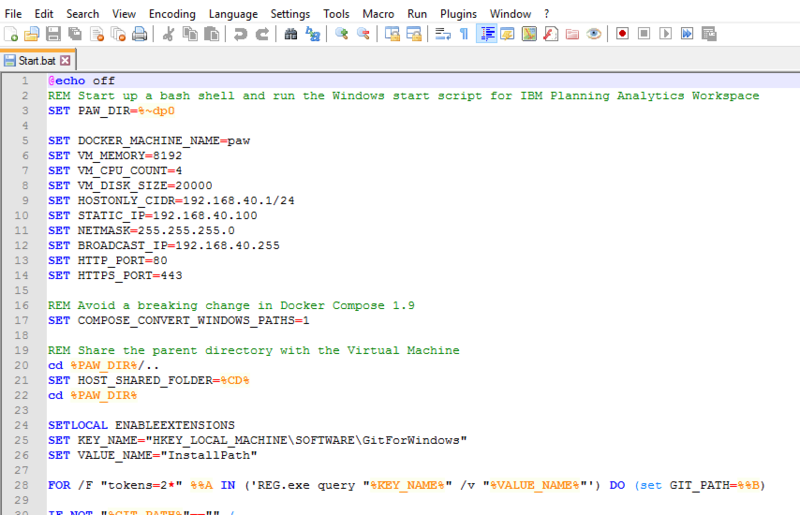 Run installation of all tools, including IBM Cognos Software Development Kit 11, on the server. 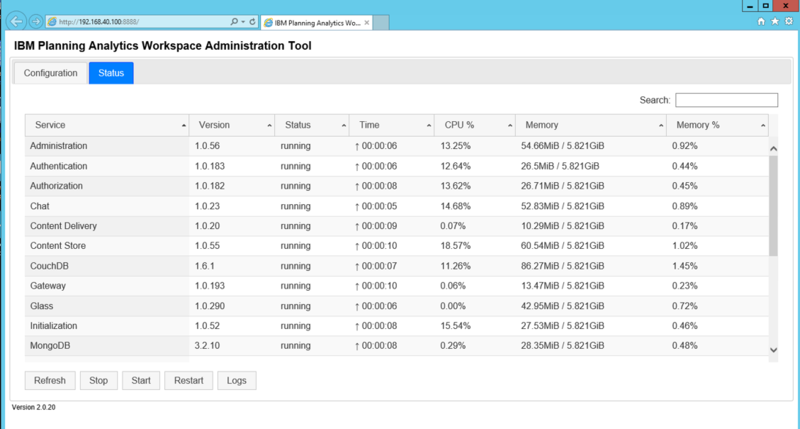 Start with the IBM Cognos Analytics Server 11.0.6.0 Microsoft Windows Multilingual (CNIN2ML). The new license, allow the administrator to use all tools. Right click on ca_srv_win64_11.0.6.17031315.exe file and select “run as administrator”. 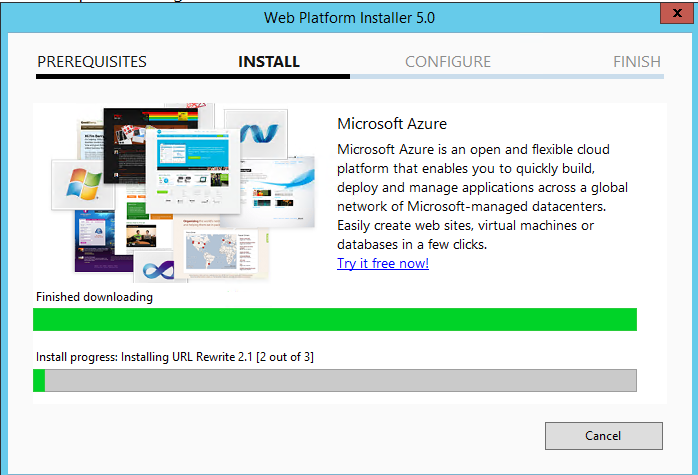 Click next to run the installation in English. 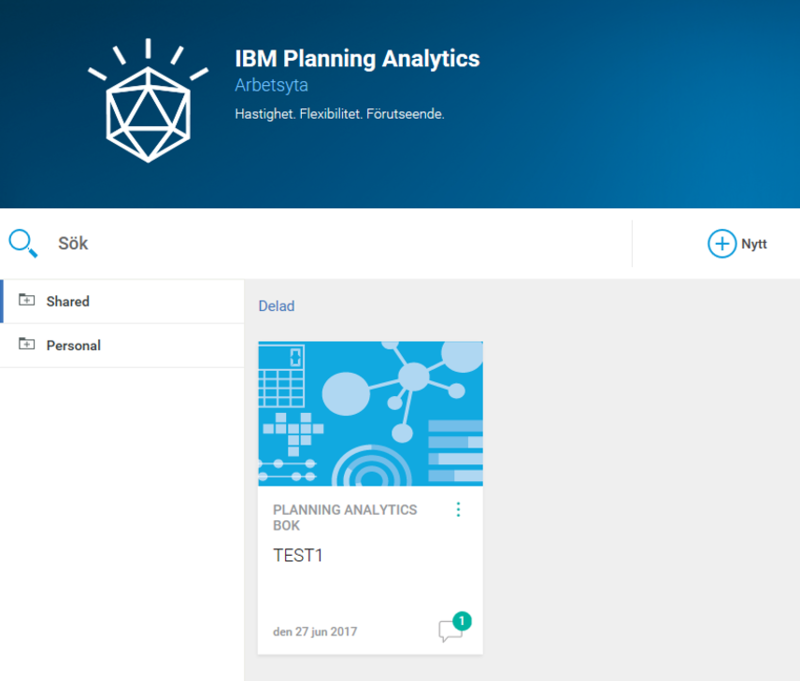 Select IBM Cognos Analytics, and click Next. 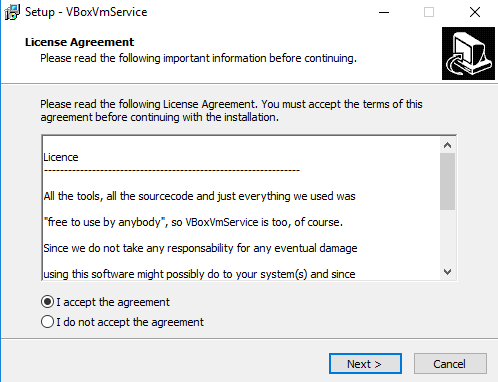 Select to Accept the license agreement, and click Next. 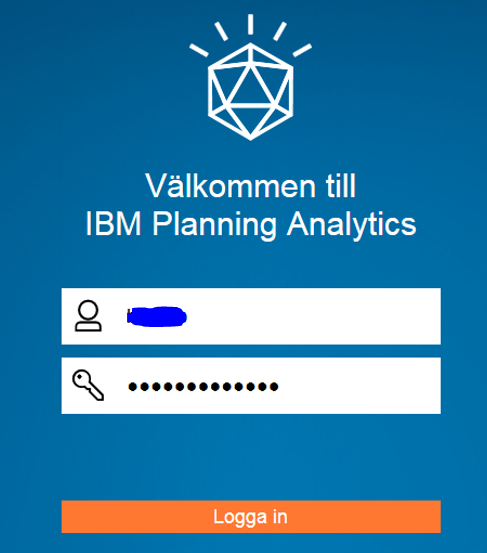 Enter the installation directory to d:\program files\ibm\cognos\analytics and click Next. Select the First Install option and click Next. Select all components and click Next. If you get a warning from the Windows firewall, check all and click on “Allow access” to continue the program installation. In later versions of CA11 you must copy file sqljdbc42.jar into folder d:\program files\ibm\cognos\analytics\drivers before configuration. Check that the CAservername is already filled in at all the fields, at Environment. The Content store need to be change from IBM DB2 to a SQL Server database. Under Data Access – Content manager, right click ‘Content Store’. Select ‘Delete’ and confirm deletion. Right-click New Resources -Database. Name the database ‘Content Store’ and select the type ‘Microsoft SQL Server database’. Click on save icon and wait. Above the default values for CA11 WebSphere Liberty Profile. Ensure the server have enough memory. 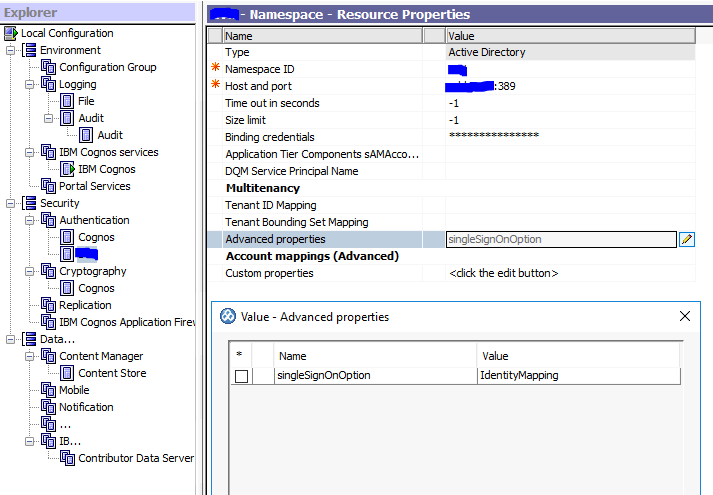 Right-click New Resource – Namespace. Provide a name of the domain ‘AD’ and select ‘Active Directory’. Click OK. Enter the Namespace ID to be the same as the namespace properties ‘AD’. Right click and test to see that the AD connection works, you must provide an existing AD users name and password for the test. Click save and click on start (triangle) to start the CA 11 service. Surf to http://BIservername:9300/bi/v1/disp to test the program. You should get to the page without the need to login. 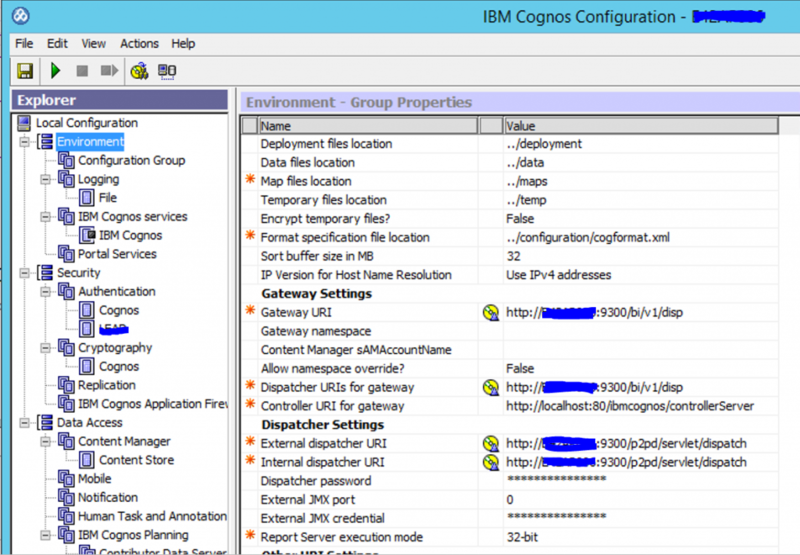 In Cognos Configuration – namespace “Change allow anonymous access” to ‘False’. Save the change and restart the Cognos services from the restart icon. Test to surf again to http://servername:9300/bi, this time you should get a login dialog. When installing the developer tools, you must enter the server name in lower case in Cognos Configuration for Cognos Cube Designer, otherwise it will not work to publish a cube. You can “pin to start”, your most used programs, to make them easy to find. 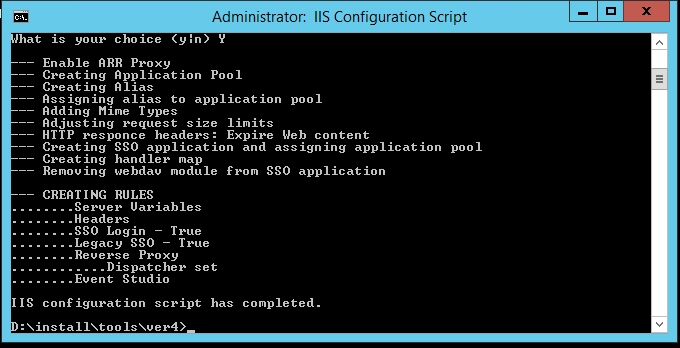 Ensure that IIS is installed on the Microsoft Windows 2012 R2 server. Click on Server Manager icon, normally in lower left corner of screen. Click on Local Server, on the left in the Server Manager. Scroll down to Roles And Features, click on Tasks icon and select Add Role and Features. Click Next 3 times to you get to “Select Server Roles”. 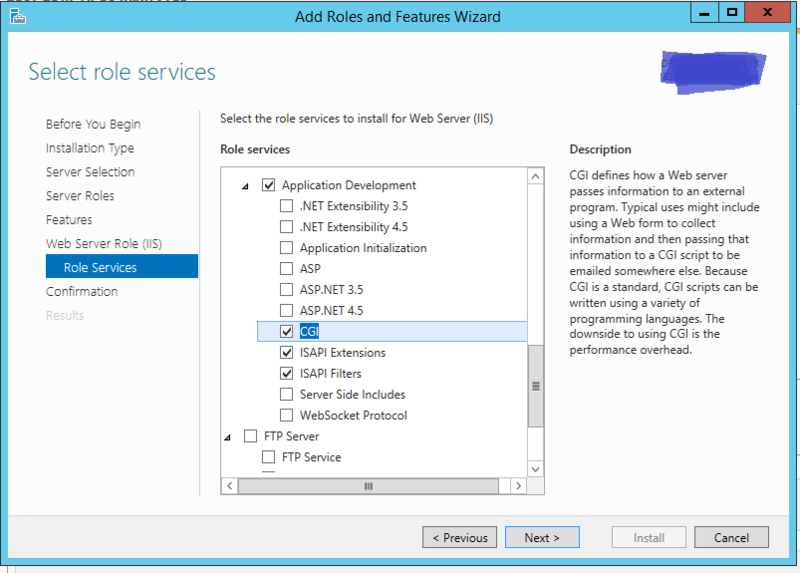 Select Web Server (iis) and click “Add features” to any question about installing additional features. Click Next 3 times to you get to “Role Services”. Click Next and click Install. • set disp[x].port is where you would put the dispatcher port number. 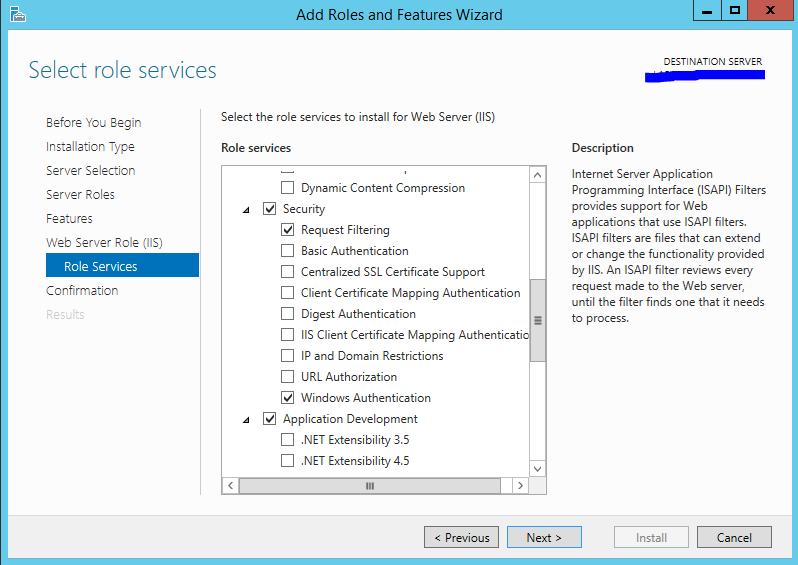 set enable_SSO To enable single sign-on capabilities in IIS, set this to True. A command windows will open with the variables that you have configured. If they are incorrect then press ‘n’ to exit and reopen the bat file to correct the issue. If everything is correct, then press ‘y’. If all is well, there should not be any errors. 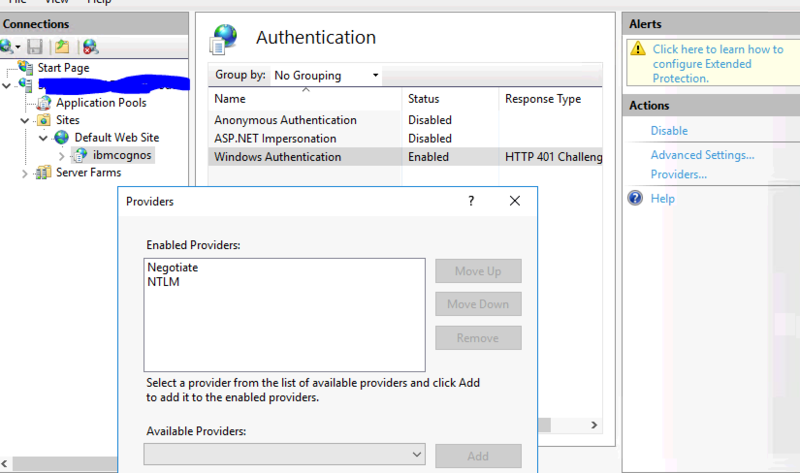 If the SSO does not work after above script is run, check first that Windows Authentication is Enabled in IIS Manager. 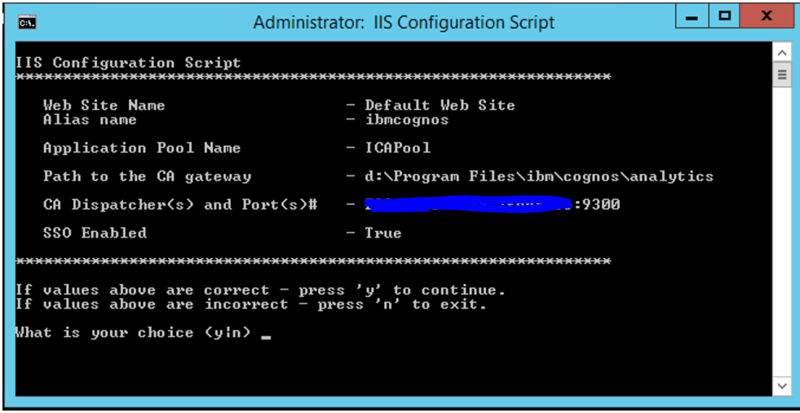 Open IIS Manager and go to the Default Web Site – ibmcognos. Click on Authentication. Mark Windows Authentication and click Enable. Ensure that Anonymous Authentication is Disabled on ibmcognos. Then add singleSignOnOption=IdentityMapping in Cognos Configuration at Security – Authentication – AD – Namespace – Resource Properties. Click on Advanced properties above Account mappings (advanced) to enter the singleSignOnOption value. 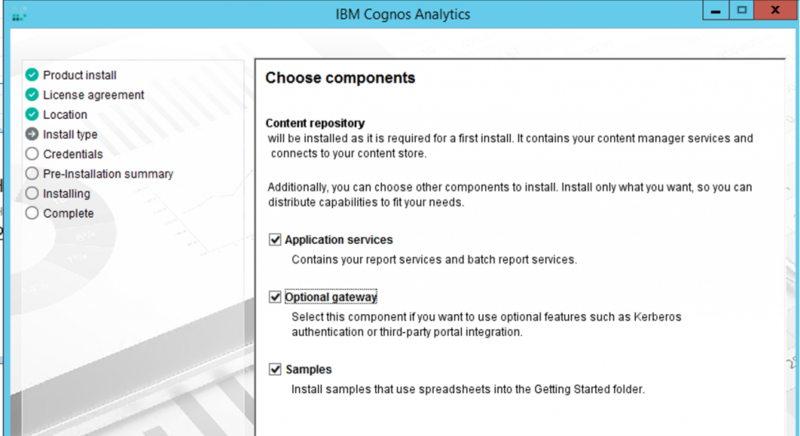 Save and restart the Cognos services. Restart the server, if it still does not work then you need to manually check out all the steps to ensure it works. Note: that for pictures to be displayed in PDF reports, you often have to in IIS manager set Authentication to allow (enabled) Anonymous Authentication on the picture folder like /ibmcognos/bi/samples/images. will give you the login without SSO. The URLs in Cognos Configuration for Cognos Analytics 11 can use the fully qualified domain name (FQDN). If you examine the .\\webcontent\default.htm and .\\webcontent\index.html file. They have no reference to cgi as before. With CA11.0.6 only database driver sqljdbc42.jar is in folder d:\program files\ibm\cognos\analytics\drivers, that should be good enough to connect to a Microsoft SQL database server. You should install a Microsoft SQL Server Native client (msncli.msi) to allow CQM reports to work. Setup Audit database and import the sample_audit.zip deployment package. Ensure Audit is configured in Cognos Configuration. 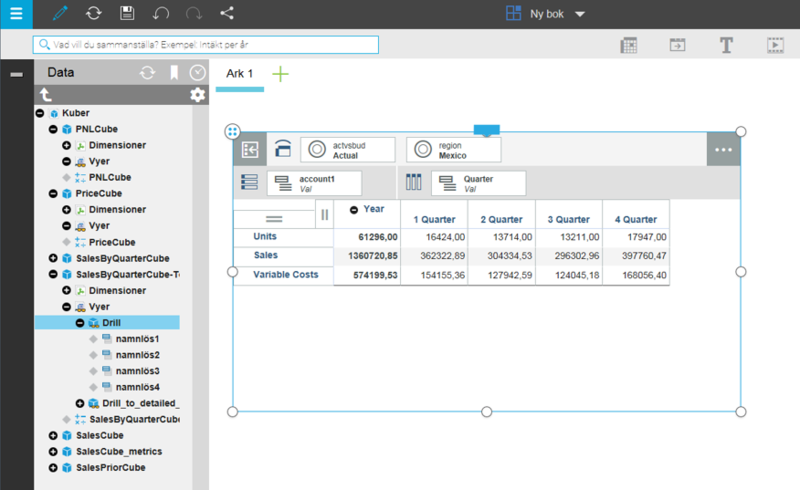 Create the data source connection to Audit database in Cognos Connection. Click on Test to test the data source link. Click on the Success text (if possible) in test connection to see more information. If you get a error XQE-DAT-0001, when you build a new report against the Audit database. Then you may have forgotten to enter the database name, test will only check to the database server, not to the database you are going to query. 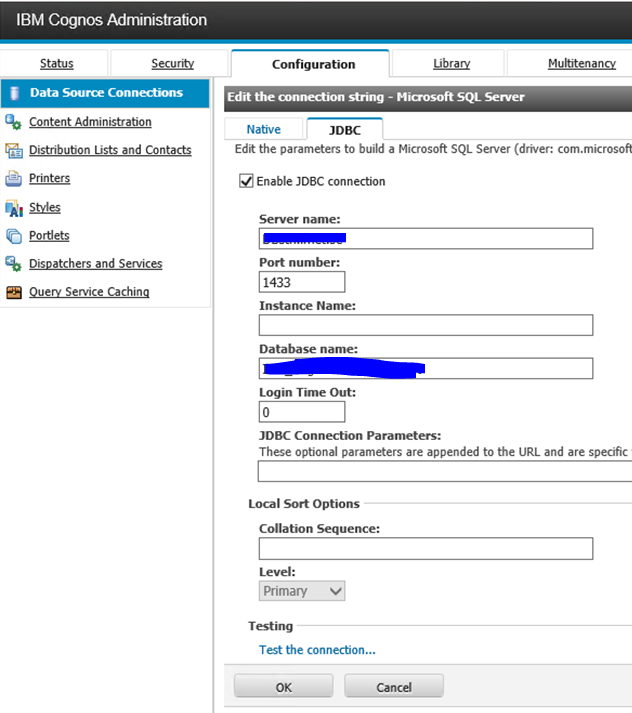 Ensure the JDBC connection have all fields filled out, for Microsoft SQL datasources. 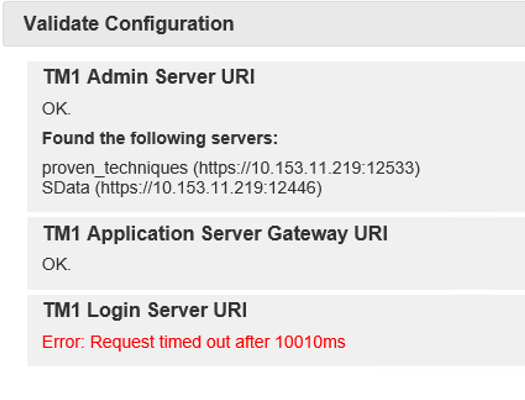 When you test a data source to a TM1 server, you may get a error like below when you use AD authentication. If you change to NO Authentication, then the data source test works. Set it back to AD external namespace authentication and build a report and test that that works to get data from the TM1 cube. How to upgrade Controller 10.2.1.x to a later Fix Pack ? This is a very good article – so i copy the text, to have it here as well. It is possible to patch an existing 10.2.1 Controller application server *without* having to perform a full uninstall/re-install of the Controller application server software. However, care needs to be taken (during the patching process) to ensure that all Controller-related services/systems/components are stopped. To check which version of Controller you are currently using, click “Help – System Info” (inside the Controller client) and check the value of the first/top line. 1. Download a copy of the patch (either a Fix Pack or Interim Fix). 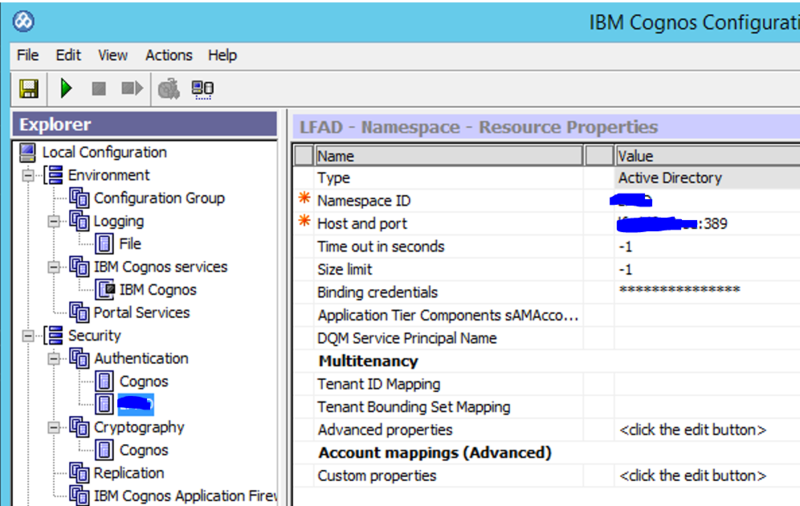 (b) Launch ” Cognos Configuration” and create a backup of all the settings. In other words, ask your ESX administrator to create a virtual snapshot backup of any server (for example Controller application server) before you make any changes. Highlight the Default Web Site. [This process helps make it easier to revert back to the older version of Controller if necessary later]. Important to uninstall the client before you upgrade the server. The uninstall program may use some of the previous versions files. 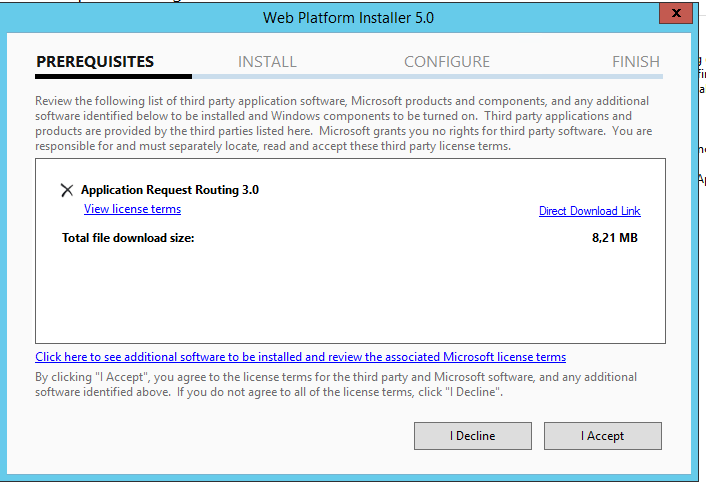 Navigate through the installation wizard (in general by accepting all the default options). If you have multiple Controller application servers, apply the patch for all remaining Controller application servers. 10. Afterwards, launch ” Controller Configuration” and open the section ‘Database Connections’. Click on each database connection, and click on the green ‘play’ button. Sometimes (depending on the old/new versions of Controller) the ” Upgrade to” will have increased (because of the patch). If so, then you must press ‘ Upgrade’ to upgrade your Controller application databases (to the latest version). TIP: Refer to the printscreens that you took earlier (in step 3 – before the upgrade) to make sure that the settings look the same as before. 13. 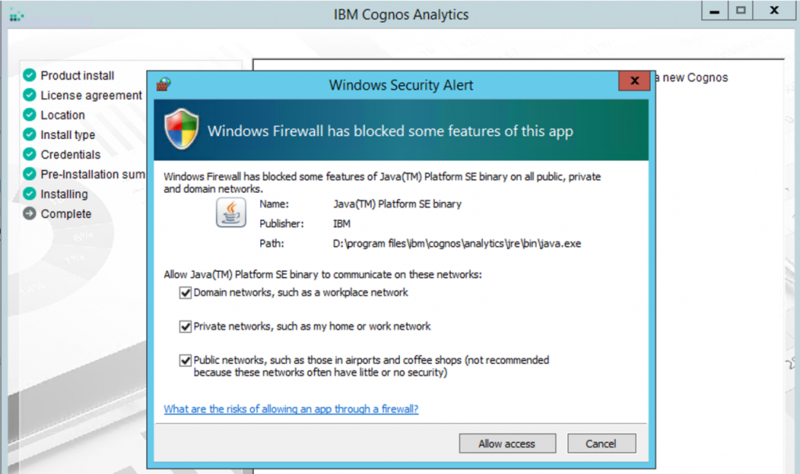 Check the Windows service ” IBM Cognos Controller Java Proxy”. Ensure that it is configured to ‘ Log On As’ using the correct Windows user (typically the Cognos Controller system user e.g. \Controller_system). 16. Upgrade client software on each-and-every end-user’s client device (see below). 1. Logon to the client device as the SAME Windows administrator which originally installed the Controller client. VITAL that you uninstall the old cognos controller client before you install a new Cognos Controller client. There are three different versions of the client – see Technote#1371088. For most customers, CCRLocalClient.MSI is the best version to use. TIP: If unsure what values to use (for example WSSUrl) then open the file %APPDATA%\Cognos\CCR\ccr.config inside NOTEPAD and read the values from there. 6. If the client device does not have access to the internet (e.g. most Citrix/Terminal servers) then modify the file “ccr.exe.config” (inside C:\Program Files (x86)\ibm\IBM Cognos Controller) as per separate Technote #1441779. There are patches coming for Cognos Controller. You decide when you need to apply them, depending on how “secure” your network is and the risk of that the Cognos servers will be affected by unwanted software. Recommendation is to always be on latest fix pack. This upgrade instructions affect IBM Cognos Controller 10.2.1, check IBM web site for instructions for other versions. 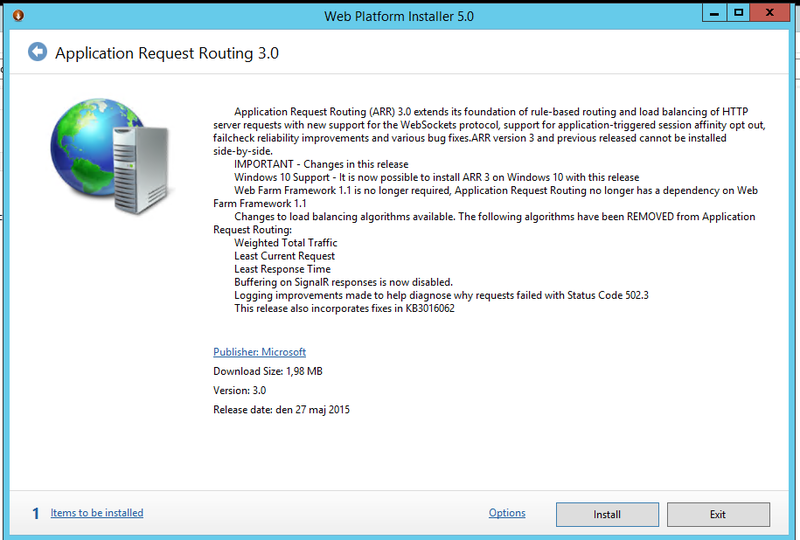 How setup PA 2.0 Local on Windows Server? How setup PA 2.0 Local? 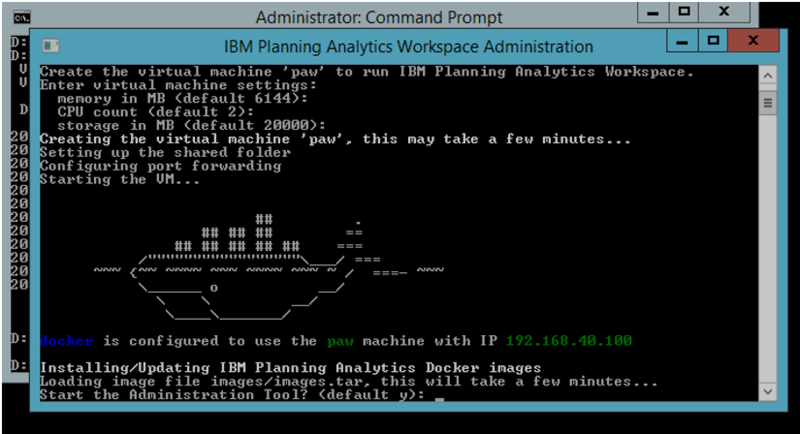 This will describe the steps to setup PA 2.0 local with Security mode 5 connected to Cognos Analytics 11 (CA) and install of Toolbox docker and PAW. This doc will not cover SSO or how-to setup a reverse proxy for CA 11. Ensure that you have a big virtual Microsoft Windows 2012 R2 server, with at least 4 CPU cores, 16 Gb ram and 200 Gb hard disk space. Recommended is to have more RAM – like 64 GB ram. This is only a suggestion for the setup of PA 2.0 Local – you should follow the instructions that come from IBM in the first hand. 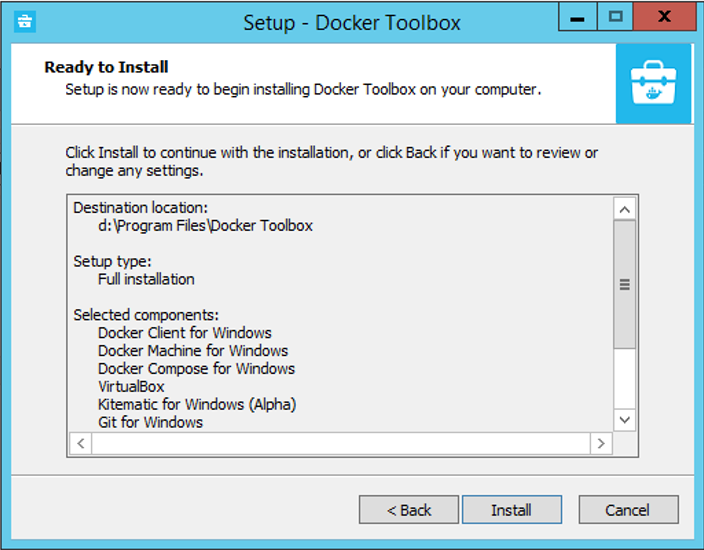 Download Docker Toolbox https://www.docker.com/products/docker-toolbox if PAW is going to be installed on Windows 2012 server. In the System Properties window, click Advanced System Settings. On the Advanced tab, under the Performance heading, click Settings. In the Performance Options window, click the Data Execution Prevention tab, and then select Turn on DEP for essential Windows programs and services only. Click OK and then restart your system to enable the change. You will now see the Internet Explorer Enhanced Security Configuration box. Click on Off to turn off the IE ESC for both users and administrators. To configure this using a GUI, go to the Start Menu, search for “Choose a Power Plan” under Settings, then select the “High Performance” option. To configure this from a command line, use “POWERCFG.EXE /S SCHEME_MIN”. By default, hidden files and folders are not visible, change this to make the work easier. Note; To hide file name extensions, check this line. 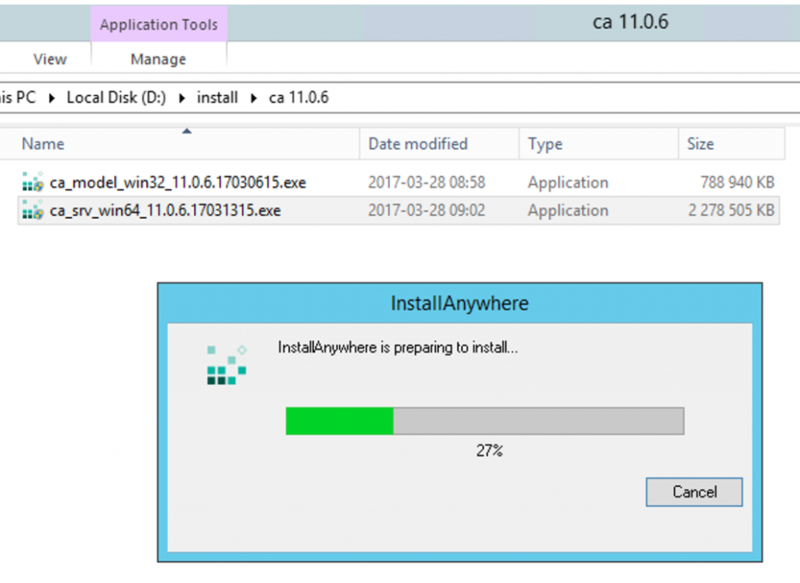 If you are going to install CA11 and PA 2.0 Local on the same Windows server you must install CA11 first. If they are not on the same server (it is recommended to have them on separate servers) you can install PA 2.0 Local first and set it up with “localhost” in Cognos Configuration Environment tab. Unzip all gz media files to different folders, and remove the .tar files to save space. Create an empty database on your SQL server, name the database to “contentstore”. Create a SQL login named cognos with the password Cognos202. Ensure the SQL login cognos is DB_OWNER on the database “contentstore”. Turn off On-Access-Scan in the server’s Anti-virus software before installing. If you get a warning from the Windows firewall, check all and click on Allow access to continue the program installation. When finish, click on Done. Start up Cognos Configuration by right click and select “run as administrator”. Check to ensure the Windows server name is under Environment instead of localhost for the important URLs. Should be same server name everywhere instead of localhost. The Content store need to be change from IBM DB2 to a SQL Server database. Under Data Access – Content manager, right click ‘Content Store’. Select ‘Delete’. Enter the Namespace ID to be the same as the Authentication name like ‘AD’. Click the save icon. You must change domain.com and the server-name to meet your environments need. Right click and test to see that the AD connection works, you must provide an AD users name and password for the test. Surf to ‘http://servername:9300/bi/v1/disp’ to test the program. This should give you how far it is to the DC server, if Time value is above 50ms you need to talk to IT department. Change allow anonymous access to ‘False’ under the cognos namespace in Cognos Configuration. Test to surf again to http://servername:9300/bi, this time you should get a login dialog up. Login to ensure the connection to Active Directory (AD) is working. Turn off the anti-virus program on the server before installing. Go to the folder where you have unzipped the PA media files. Right click on file D:\install\pa 2.0.1\pa_2.0.1_win_ml.tar\winx64h\iisetup.exe and select ‘run as administrator’. Click Next to get English as installation language. 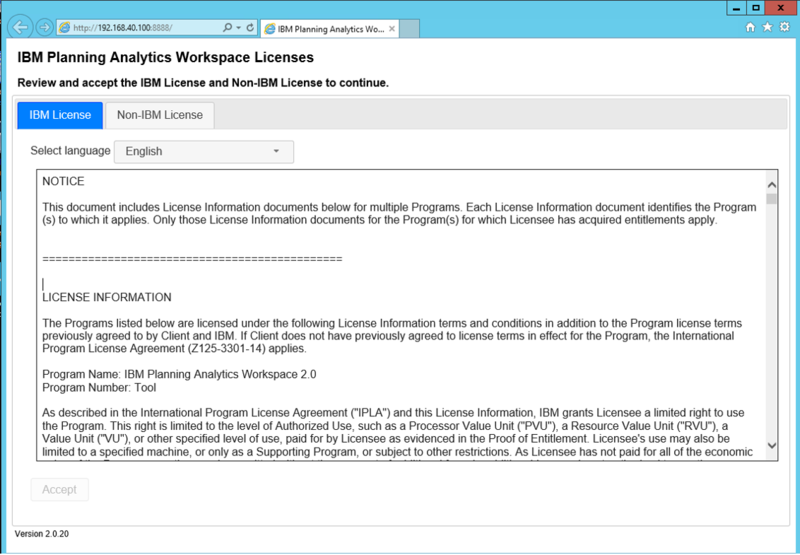 Click I agree to the IBM License Agreement, and click Next. Enter the path to the installations folder and set the server use type to Production (if this is the production server) and click Next. Server use type can be used by ILMT software to list the server as production or not. Mark ‘Make the shortcuts visible to all users’ and click Next. It should finish without any errors. 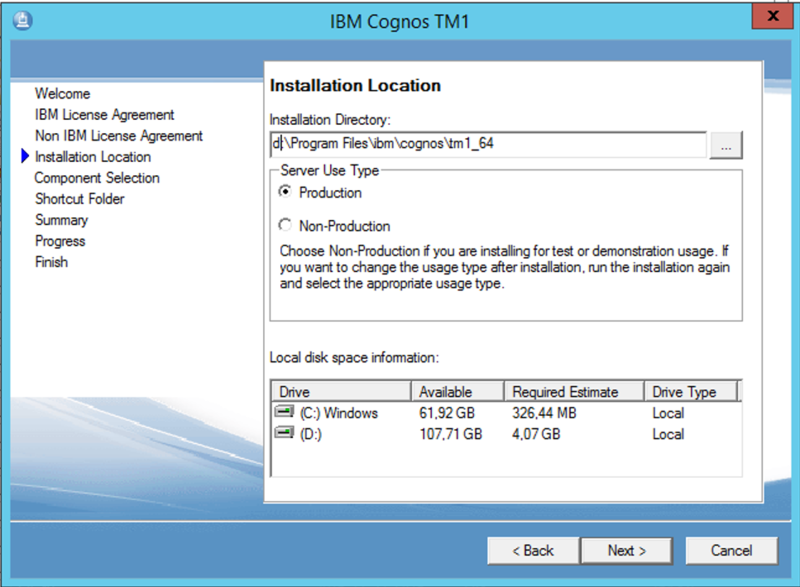 Right-click IBM Cognos Configuration for IBM Cognos TM1 – 64. and select Run as Administrator. Go to Environment and enter the server name of the BI (CA11) server (if BI is not on same server as PA, then some fields should point to PA) instead of localhost. Click on save icon. 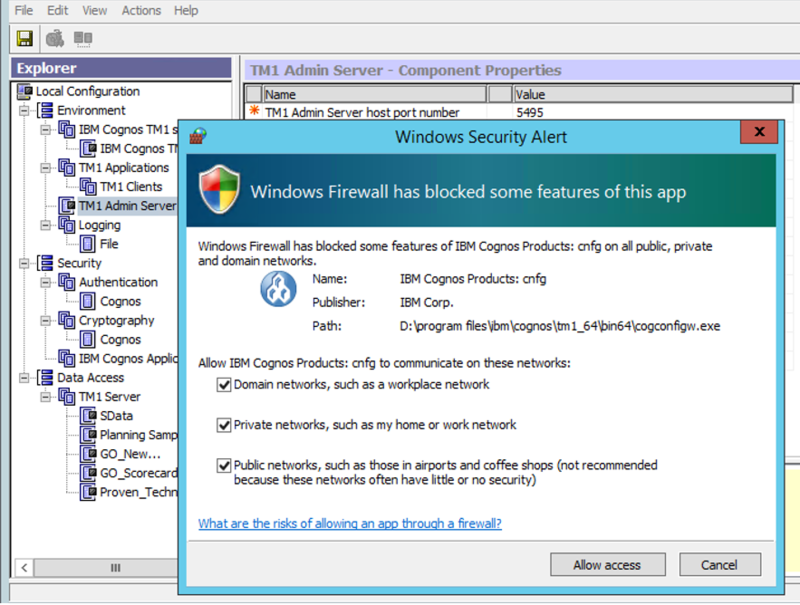 If you get message from Windows Firewall , click on Allow access. Right click on TM1 Admin server and select start. Go to TM1 applications and enter the server name of the TM1 server you are configure instead of localhost. Click on the save icon. 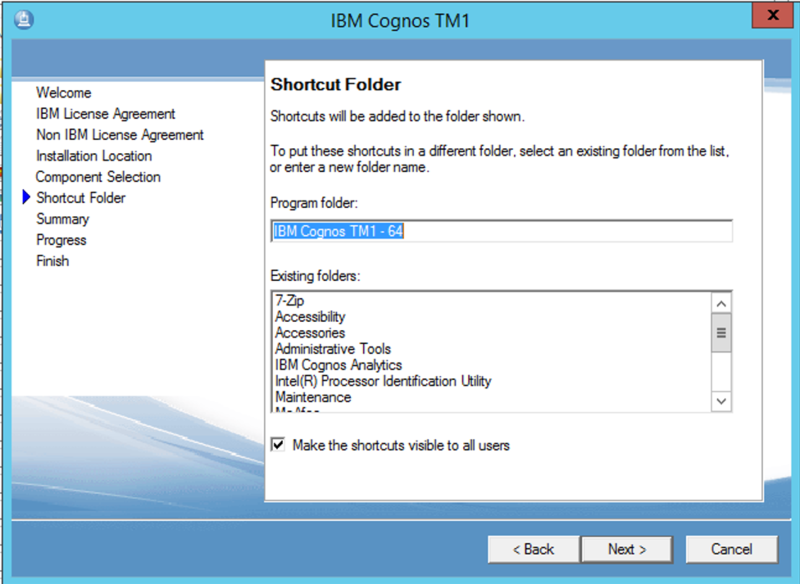 Right click on IBM Cognos TM1 under IBM Cognos TM1 services and select start. Go down to TM1 servers, and start the SData and Proven_Techniques sample TM1 data models. SData is default used by Opsconsole as the holder of user’s login. We use Proven_Techniques to test the CAM security later. Start TM1 Architect and test that you can login to Sdata. User name is Admin and password is apple. 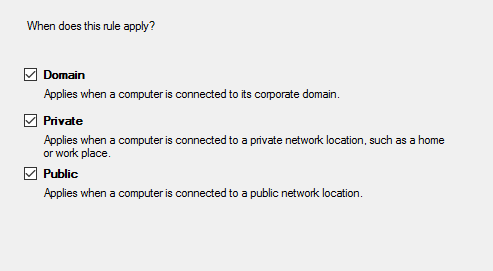 To access the PA 2.0 Local from other computers, you need to open some ports on the Microsoft Windows firewall on the 2012 server. Ensure ‘allow the connection’ is select and click next. Mark all options for the rule to apply and click next. Enter a name, like “Cognos Tm1” and click on Finish. 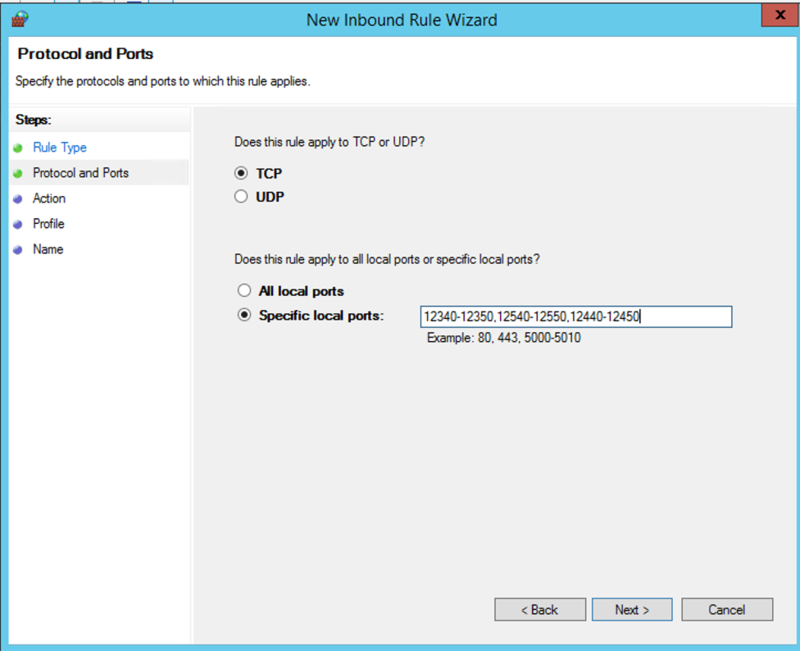 Repeat the above for a new rule for the TM1 applications ports. We may have missed some needed ports, like 1433, that you also need to open in the Windows firewall on the server. If there exist router firewalls between the servers, then you also need to open the ports in there. Surf to http://PAservername:9510/tm1web to test tm1web. TM1 applications should you not setup yet, if you are going to use CAM security. Start Cognos Configuration for CA 11, and change to not allow anonymous login. Save and restart the CA 11 windows service (IBM Cognos). 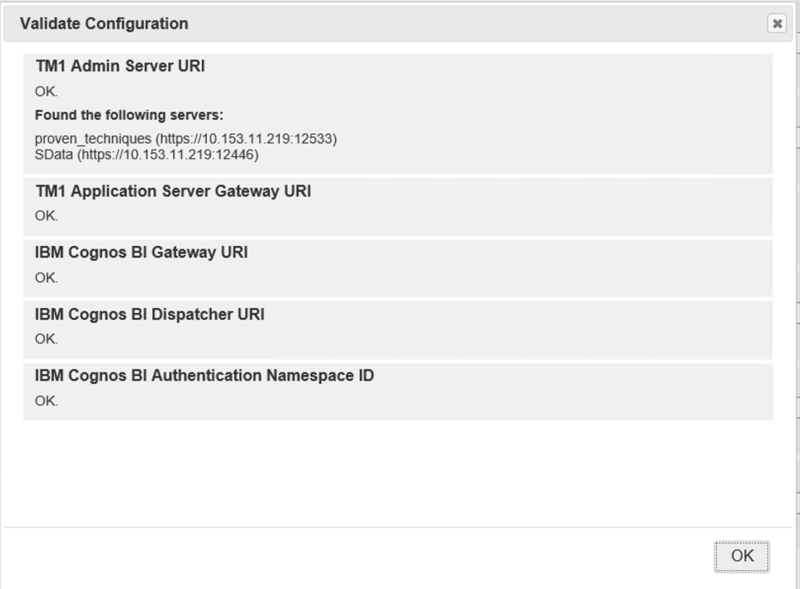 Open Cognos Configuration for PA 2.0 and in Environment section copy the URL for gateway and internal dispatcher to notepad. This should be used in your TM1S.CFG file. Close TM1 architect, if it is open. Click start and select Command Prompt (admin). From the cmd dialog enter notepad and press enter. This will start a notepad in admin mode that can write to \program files\ folder. From inside Notepad select open and find tm1s.cfg in folder d:\Program Files\ibm\cognos\tm1_64\samples\tm1\Proven_Techniques\. You need to change notepad to show all files and not only .txt. From inside Notepad (in administrator mode) open the tm1p.ini file for your user. 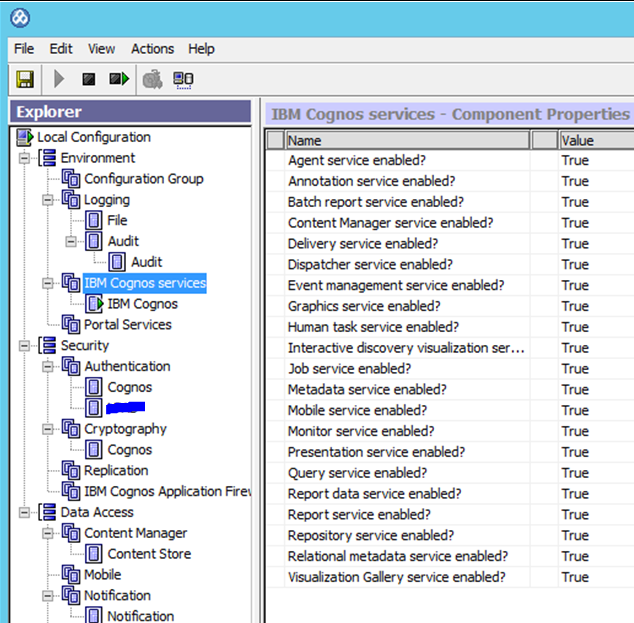 Change AllowImportCAMClients = F to AllowImportCAMClients = T.
Check that Cognos BI service ‘IBM Cognos’ is running. Restart your TM1 services, like IBM Cognos TM1 Server – proven_techniques. Start TM1 Architect and login to proven_techniques. Use the native login of Admin and password apple. When inside, select the application and right click and select security – clients/groups. From menu clients, select add new member. At the login prompt enter the AD username and password you have. 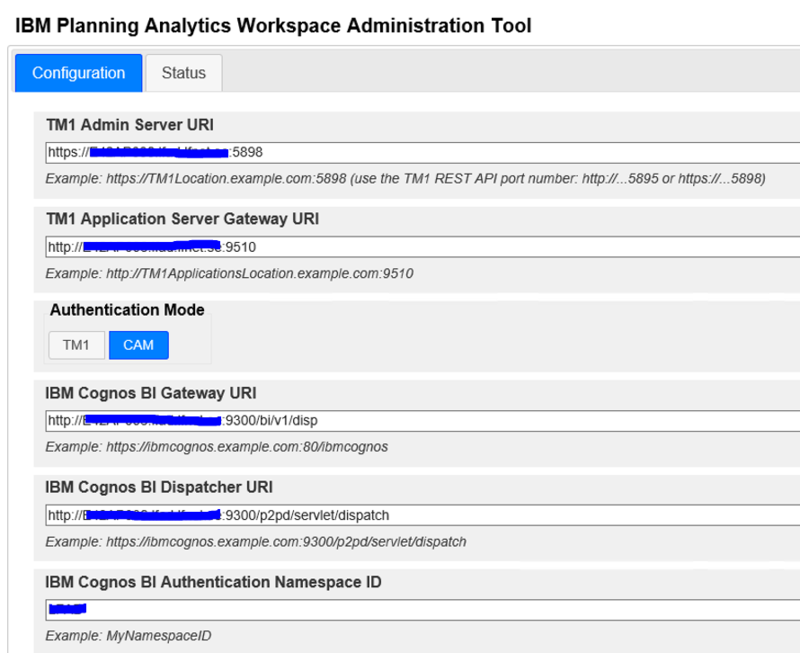 You should get to Cognos Connections add users dialog where you can select Cognos and your AD namespace. Go to you AD namespace, and search for the Windows users you want to be able to work in your application. In this test, only add one user (you). Where first is your AD namespace name and after the slash is the NT user name. Click on the arrow to add the user, and it should resolve to display name. Click OK to add the user to your TM1 application. Mark ADMIN for that user before you exist TM1 architect. Start NOTEPAD from Admin command prompt. Open the tm1s.cfg file from d:\Program Files\ibm\cognos\tm1_64\samples\tm1\Proven_Techniques folder. Save the tm1s.cfg file and exit notepad. 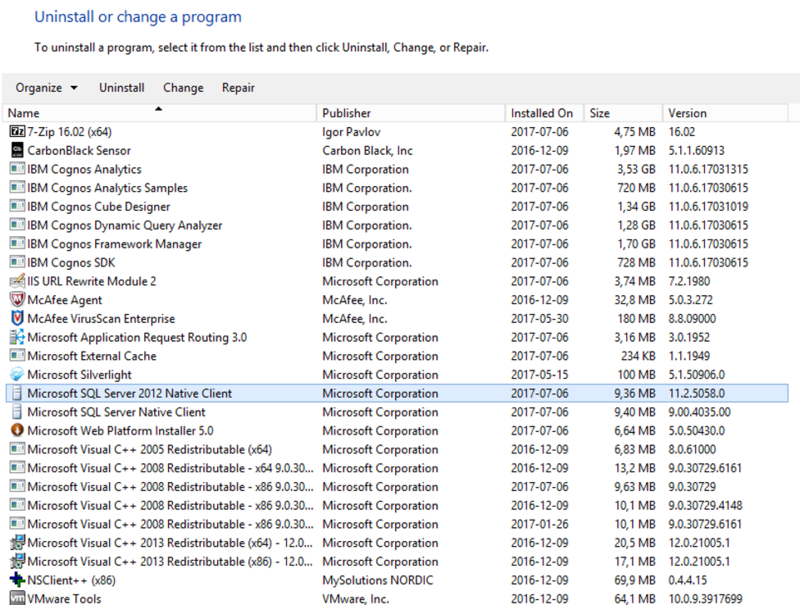 Restart the TM1 windows service proven_techniques. Wait a long time to allow the services to start. Start TM1 Architect and login to proven_techniques, you should be prompted with the CA 11 login page, and come in as the user you have just added. You need to repeat above step of adding users for your TM1 applications, so you get the first CAM user to be Admin inside the TM1 application. To get TM1WEB and PMPSVC to work with CAM security you need to update some file in your Cognos BI (CA 11) server. On your PA 2.0 Local (TM1) server unzip the file d:\program files\ibm\cognos\tm1_64\bi_interop\bi_interop.zip to a new folder. Copy the webcontent to the folder d:\program files\ibm\cognos\analytics\webcontent to merge the content. Copy the templates to the folder d:\program files\ibm\cognos\analytics\templates to merge the content. Start Notepad from a admin command prompt, to be able to save the files later. Start the CA 11 ( IBM Cognos) service. Wait until it is started. Startup PMPSVC for the first time, now when you have cam security in your application and support for it setup in the cognos bi (CA 11) server. All url should be correct populated. 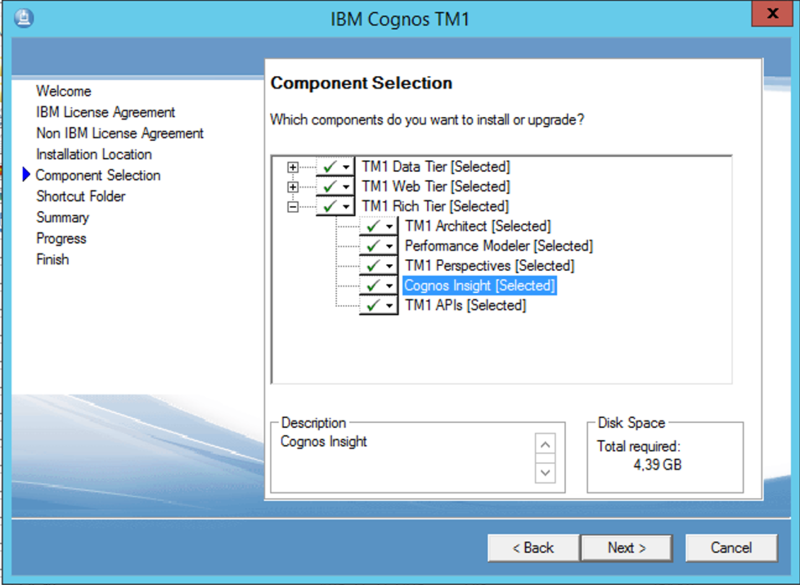 If you are missing information – check the TM1 Cognos Configuration section. You may have a localhost line there. Mark the Cognos BI dispatcher and click OK to save the settings (they are save to the file d:\Program Files\ibm\cognos\tm1_64\webapps\pmpsvc\WEB-INF\configuration\ fpmsvc_config.xml). Now only applications with the same security (IntegratedSecurityMode=5) will work in TM1 application portal (pmpsvc). User who need to access the admin functions in pmpsvc, can need to be part of the first TM1 application you added to the list of PMPSVC TM1 applications (instances). 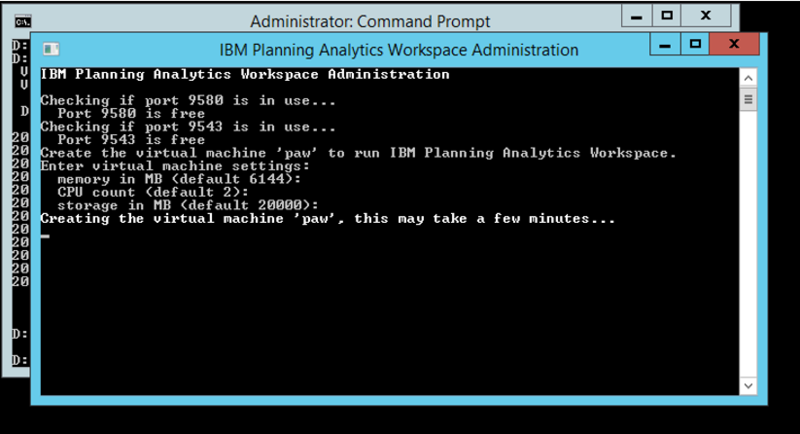 The new Planning Analytics Workspace (PAW) in IntegratedSecurityMode=1 point to ONE TM1 instance, that must contain the admin users who can change the PAW settings. PAW only work with IntegratedSecurityMode=1 applications or IntegratedSecurityMode=5 applications, you cannot mix IntegratedSecurityMode for applications that interact with the PAW. Simplest is to use IntegratedSecurityMode=1 in your application, but then the TM1 super user need to handle the name and password administration. With IntegratedSecurityMode=5 you can use the Active Directory (or LDAP) functions, and user and password administration can be handled by your IT department. Run the utility, and go to the cpu technologies tab. 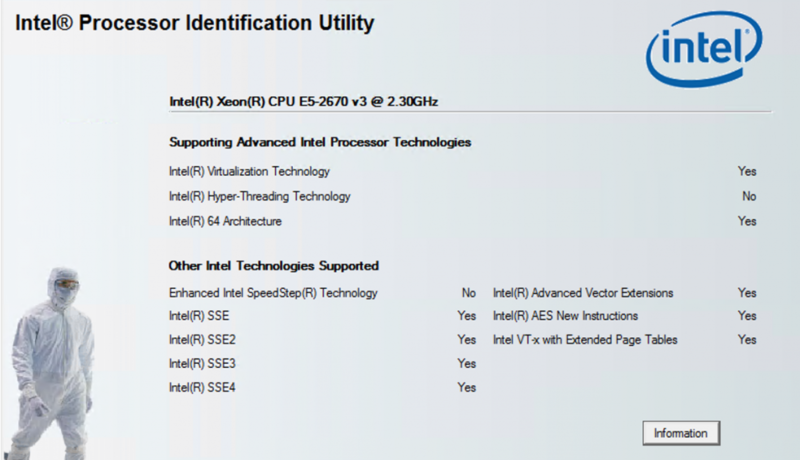 The Intel VT-x with EPT must read a value of Yes. If No, you must active VTx in your system before we start installing PA 2.0 Local PAW. This mean your VMWARE guru need to change in HOST BIOS, enable VT-X support in the HOST VMware console, and for change VT-x support for the image you plan to run PAW in. Note; that some versions of Hyper-V or VMWARE does not support VT-x, here can you not install PAW. Best is to create a folder, d:\vbox, for the virtual machines on your server. Go to Control Panel \System and Security\System. Go to CMD prompt and enter SET to see a list of all variables in use. Check that the MACHINE_STORAGE_PATH is listed correct. 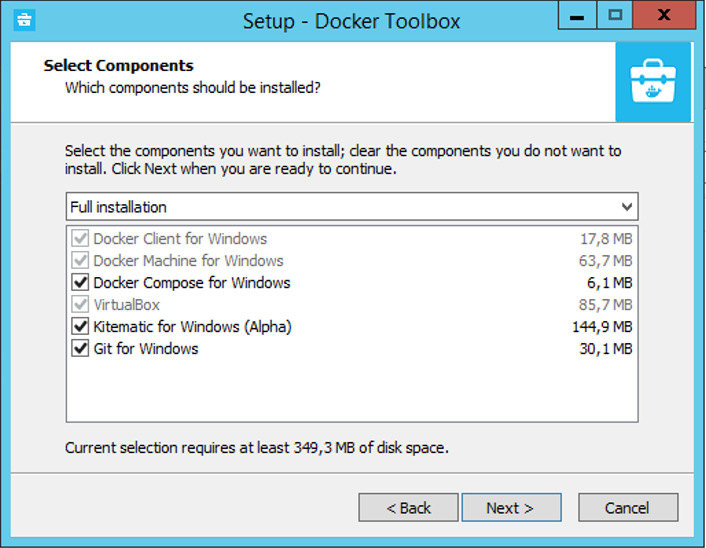 For Microsoft Windows 2012 you must download the “docker toolbox” installation program. 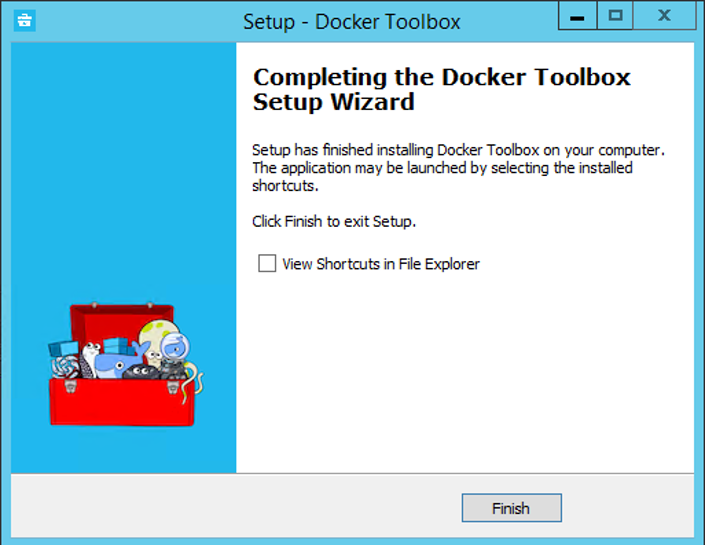 Right click on DockerToolbox.exe and select “run as administrator”. Untick ‘help Docker improve Toolbox’ and click Next. 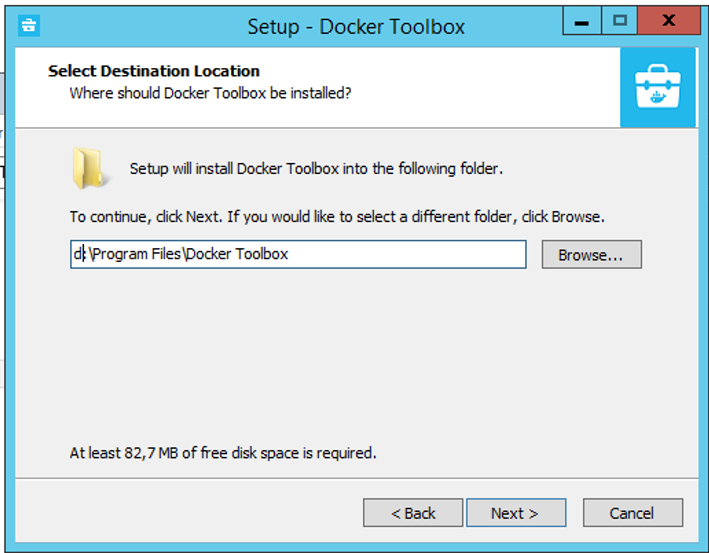 Enter the path for the program (d:\program files\docker toolbox) and click Next. Choose Full Installation and click Next. 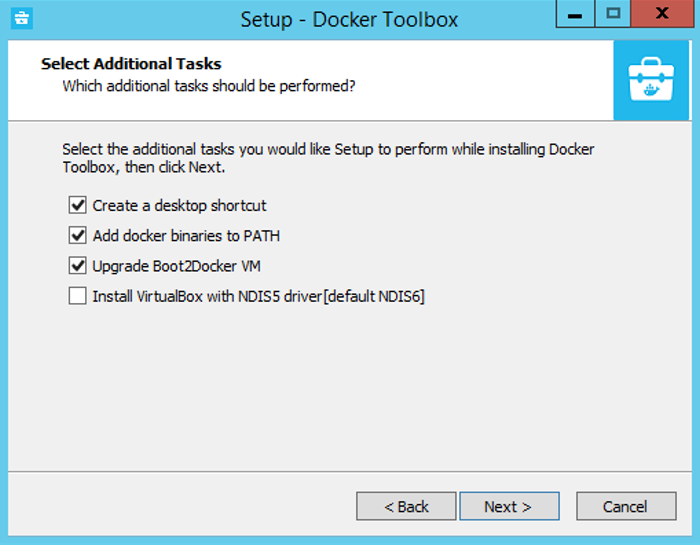 Uncheck ‘Install VirtualBox with NDISS driver’ and click Next, at additional tasks. If you get the question to install ‘Oracle Corporation Universal Serial Bus’, click Install. Uncheck ‘View Shortcuts in File Explorer’ and click Finish. This should give you some new icons on the desktop for Oracle VM VirtualBox. This will only work with VirtualBox Version 5.1. Important to reboot the Windows server before installing the PAW program. You need to download the latest PAW installation file from IBM Fix Central. Unzip the ipa_workspace_local_2.0.20.770.4.zip file to a folder on the server. Place the files in an easy accessible folder, because you will check the log files here. The start.bat file contain values you can change. Open it in Notepad before installation, to change the memory the PAW image will use and the Ports the program will use. If it is run one its own server, then leave the default ports at 80 and 443. In the case we install it on the same server where we have Cognos BI or IIS installed, then change the ports to 9580 and 9543 (so they will not collide with IIS port 80). You should not change the CPU COUNT to less than 4 CPU, then it will become slow. But your host server must have at least the same amount of CPU, and best if it have 2-4 Gb ram more than the PAW will use. If your VMware host use the network 192.168.40.x you should change the Networks values to a different not used network. echo Install Docker Toolbox for Windows and try again. On the Windows server right click on start and select ‘command prompt (admin)’. In the CMD window, CD to the folder where you have your Start.bat. Enter START.BAT to start the PAW installation. You must enter START.BAT, if you enter only START it will fail. and give you an option to change the memory and cpu usage. Creating the virtual machine “paw” takes a very long time. Press Y when you get the question about starting the Administration Tool. This will start a IE Browser one your host accessing the Admin page, accept both license before you can move on. In the Configuration tab you should enter your TM1 servers name. Under Authentication Mode when using TM1 you should point to the Window server where you have your TM1 instance using a specific port, that will be your TM1 application to control who will have access to the Administration tool. Click on validate button, to check the values you entered are working. If you get an Error: Request timed out after 10010ms, you maybe have entered the wrong port number. Click UPDATE when you get the Validate to work. The start of PAW will take some time, click on STATUS and then on REFRESH to see the progress. When CPU usage is low like 1%, then it is ready and you can surf to the PAW (Planning Analytics Workspace). 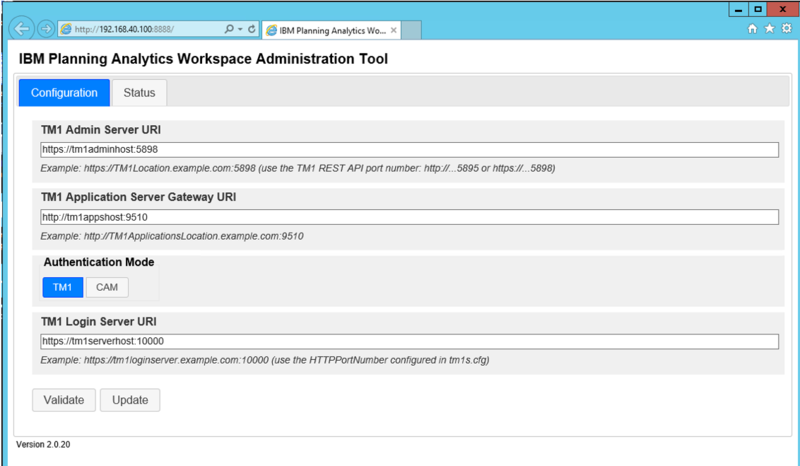 Login with the user and password you have in your TM1 application. In our test, click on a new book and expand and drag some view of the cube onto the canvas. Click on Save icon up at the left side to save your designs. Docker Machine is not installed. 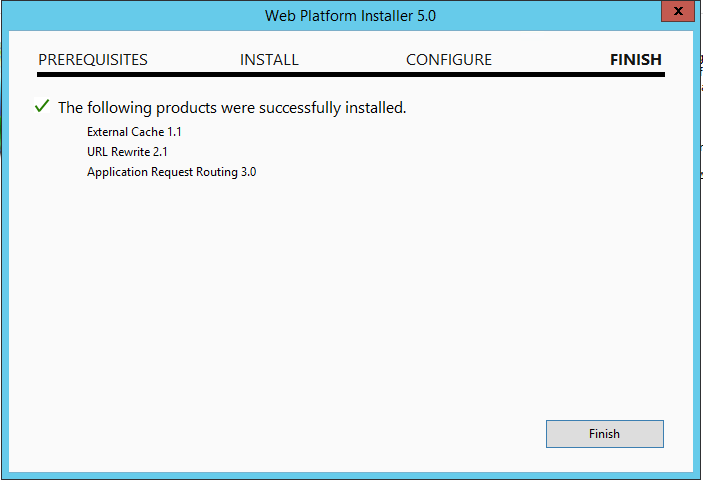 Please re-run Toolbox Installer and try again. Good you had internet connection, so it could download the file. Change the VMWARE host to support VTX. You have been changing the file \scripts\winstart.sh in attempt to get past the VTX issue. Check that you have not missed a space. If not already started, run START.BAT, and select NO on update PAW, instead say YES to start the Admin configuration. Here at the Configuration tab click on CAM button and fill in the values for the BI server. 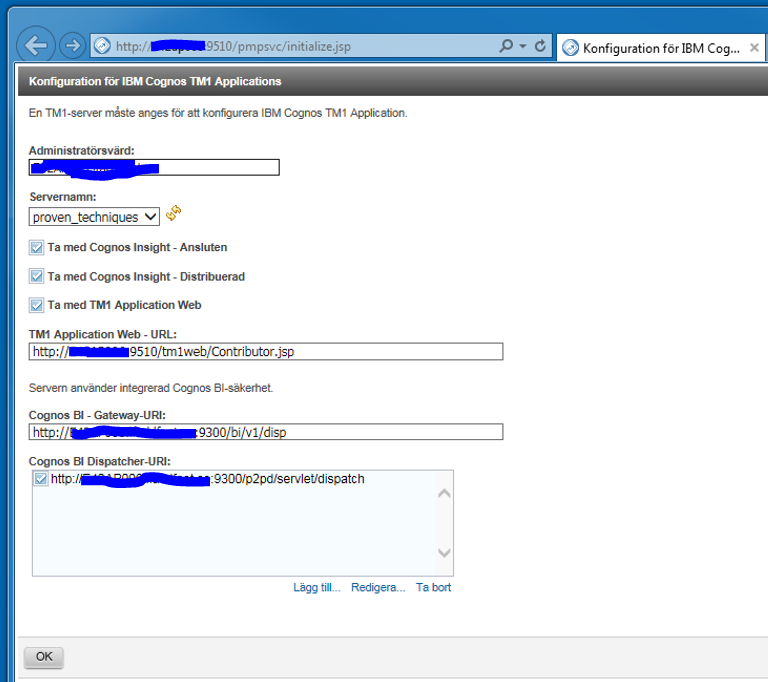 IBM Cognos BI Authentication Namespace ID = Exact the same Namespace ID you entered in Cognos Configuration for CA11 (this is case sensitive). Click on validate and OK.
Go to status tab and click on the RESTART button to make the changes take effect. 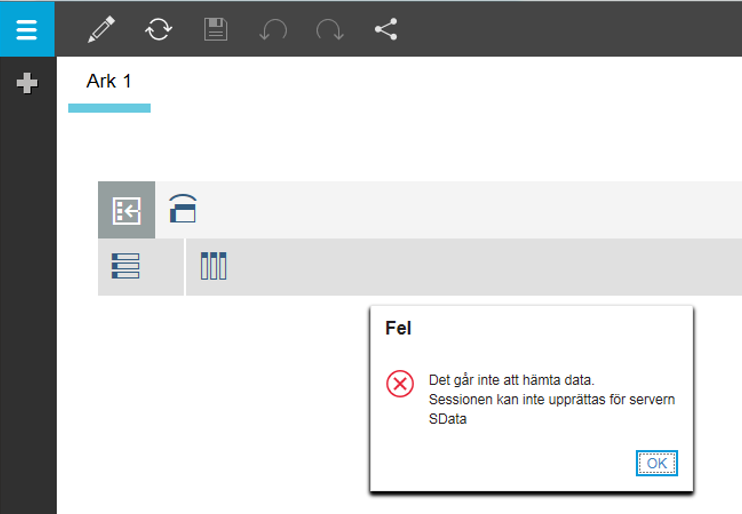 Cannot create the session for server SDATA. The SDATA application use Native security and you have setup PAW to use CAM security. Only use CAM security enabled TM1 applications with your PAW installation. The server it temporarily unable to service your request due to maintenance downtime or capacity problems. Please try again later. Wait or reboot the services. Important to reboot the windows server before configuring PAW to be run as a service. Rigth click on VBoxVmService-5.1-Plum.exe and select run as administrator. Mark “I accept the agreement” and click next. 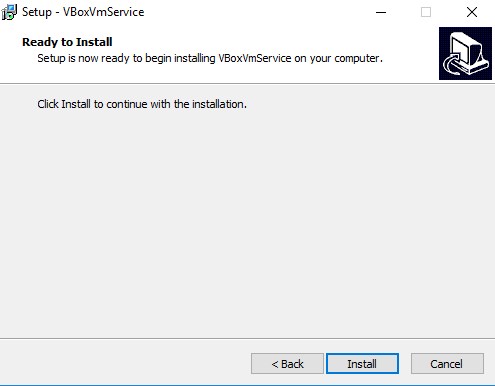 Open the file d:\vms\VBoxVmService.ini in notepad. Change it to handle the paw image and take away the last image. Check the log file to ensure the service start up correct. 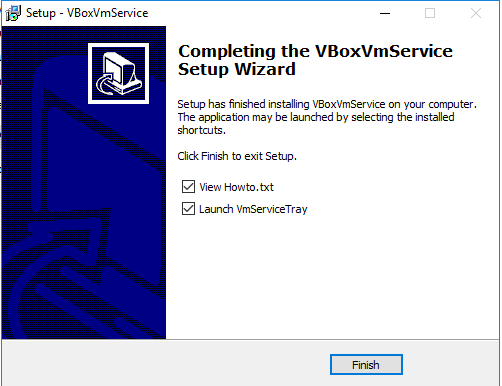 You must test reboot of the Windows server to find the best settings for this vbox service settings to work with PAW. You have too little memory free, the last shutdown of the vbox did not work. Run the START.BAT from a command prompt to get to a java prompt. Explore and create better scripts for your use. The backup files are stored in a folder under d:\install\ipa_workspace_local_2.0.20.770.4\backup. When TM1 instance is down, you can also make a backup of the log files folder. Note: in code you need to replace “ with ” to make it work.